From right: Secretary-General Ban Ki-moon, broadcaster Femi Oke and Deputy Secretary-General Asha-Rose Migiro at Women's Day event. Secretary-General Ban Ki-moon today joined other senior United Nations officials on the eve of International Women’s Day in highlighting the potential of rural women to improve the well-being of entire societies if given equal access to resources and set free from the discrimination and exploitation that hold them back. 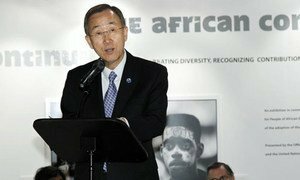 Secretary-General Ban Ki-moon today called for greater efforts to remove barriers that hinder women’s full participation in the economy, citing lack of access to jobs, markets, credit and property as some of the impediments.